In order to develop the sign language skills of female employees, the Deanship of Admission and Registration (Female Section) held a course entitled "The Basics of Sign Language." The first period took place on Wednesday and Thursday, 17-18 Jumada Al-Awwal, 1440 A.H. The second period took place on Wednesday and Thursday, 1-2 Jumada Al-Thani, 1440 A.H. The course aimed to teach female employees how to communicate with students with special needs (in the hearing impairment stream at the university). The definition of sign language in the context of social relations. The course was organized as part of the community partnership with the Deanship of Student Affairs (female section). The course was presented by Marwa Ayish Al-Harbi and attended by 26 employees. 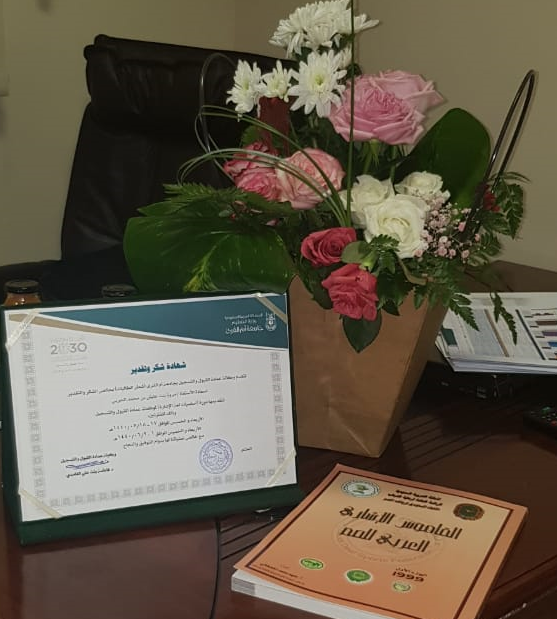 At the end of the course, the Deanship of Admission and Registration thanked the instructor for the presentation of the course, and the female employees for attending the course, which was designed to develop the functional and social skills of female employees according to the vision and mission of the university.